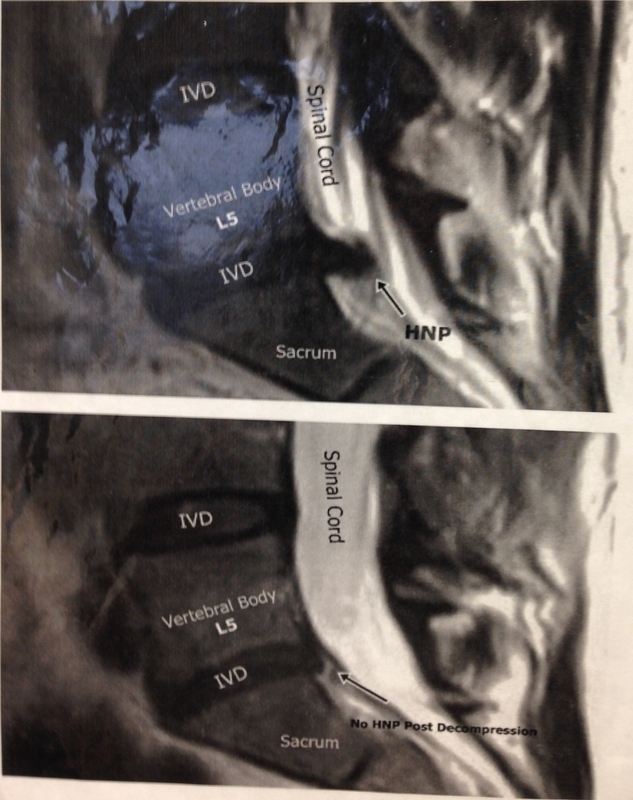 An example of what a herniated disc looks like before and after spinal decompression. 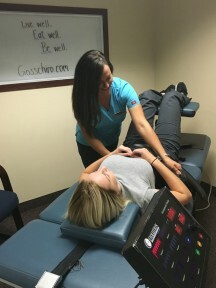 The EVOLUTION DT™ Spinal Decompression System is what we treat our neck, low-back, and leg pain patients with here at the Goss Chiropractic Clinics. It is the absolute finest decompression system in the industry providing patients throughout the world with welcomed relief to their lumbar and cervical disc disorders. The design of the Evolution DT™ offers outstanding clinical results with the most comfort available. Treatments are so relaxing that 9 times out of 10 patients will actually fall asleep during treatment sessions. If you are tired of your pain your disc disorder is causing you day after day, it is finally time that you do something about it. Non-surgical spinal decompression is “the” safe alternative to spinal surgery and a lifetime of pain medication intake. Non-Surgical Spinal Decompression is new technology that is used to treat disc disorders of the neck and/or lower back. The Evolution DT™ Spinal Decompression System that we use here at Goss Chiropractic Clinics is FDA cleared. Decompression separates the discs from each other through a cycled and graduated manner which creates negative intra-discal pressure (Vacuum Effect) which promotes a diffusion of water, oxygen and nutrients to flow inside the injured disc which allows healing to ensue. The Evolution DT Spinal Decompression Table captures and distracts the lumbar and cervical discs through a unique design by Hill Laboratories that is not found on any other decompression system on the market. Unlike other spinal decompression tables, the Evolution DT™ does not utilize traction components such as a traction head, traction motors, pulleys, coil springs, cables, or pelvic harnesses. It is called the Evolution DT™ because it truly is the newest evolution in spinal decompression therapy technology on the market today which produces outstanding clinical results. The Evolution DT™ was designed and manufactured by Hill Laboratoreis, a leader and trusted name amongst the medical establishment for creating superb quality equipment that is helping patients around the globe get their health and life back. The Evolution DT™ is more suitable for a broad spectrum of patients than the older decompression systems on the market, including those whom are geriatric, obese, and petite. Accurate and easy adjustments accommodate patients from petite to very large (600 lbs) persons with the most comfort in the industry. Other decompression systems on the market cause great discomfort to the patient in the forms of uncomfortable treatment sessions due to outdated harness pulley technology and painful spasming which is a notable downfall to those systems based on a cable driven design. The Evolution DT™ is driven by actuator technology which reacts to the human body in milliseconds which effectively gets past the body’s guard factor, truly enabling the injured discs to effectively undergo decompression forces while prohibiting any spasming from occurring. You now have the chance to change your life for the better. Call Goss Chiropractic Clinics or stop in today for a free consultation. Your road to recovery and pain-free life starts today!